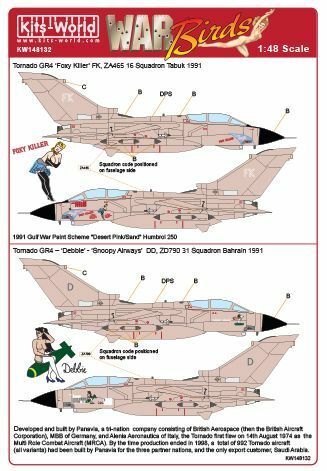 Desert Storm Panavia Tornado GR.4 - 'Nikki - Nora Batty - Snoopy Airways' NN, ZA491 20 Squadron Tabuk 1991. 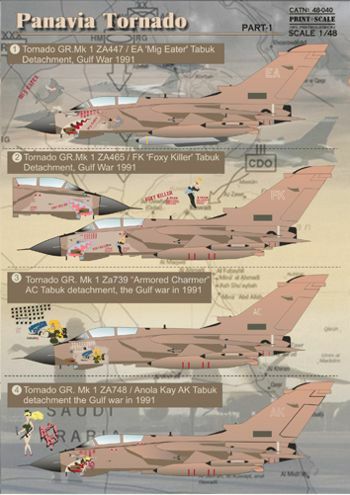 GR.4 - 'Gulf Killer' GK, ZA452 20 Squadron Tabuk 1991 GR.4 - 'Mig Eater' EA, ZA447 15 Squadron Tabuk 1991. 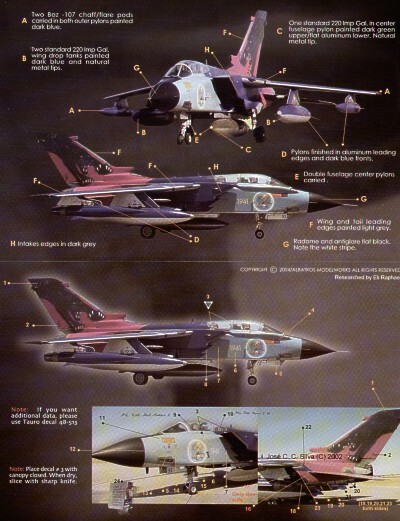 GR.4 - 'Alarm Belle AB, ZD746 9 Squadron Tabuk 1991. 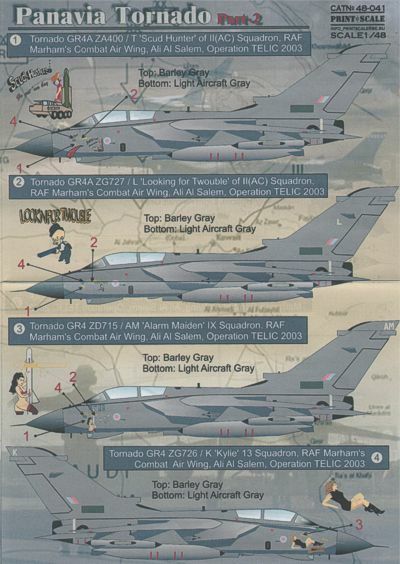 Panavia Tornado GR.4A, ZA395, '1915-2014 Commemorative scheme 12 Sqn, Lossiemouth, Scotland, 2014. 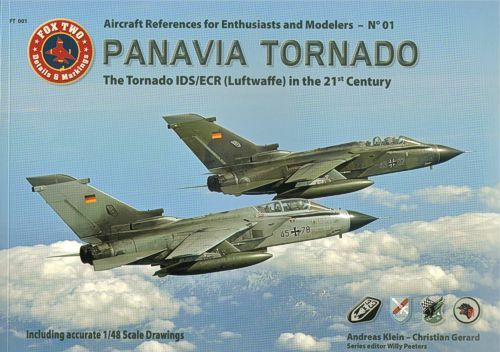 Panavia Tornado, ZA543 "Commemorative 1915 " 2005 Leads the Field" 12 Sqn, Lossiemouth, Scotland. 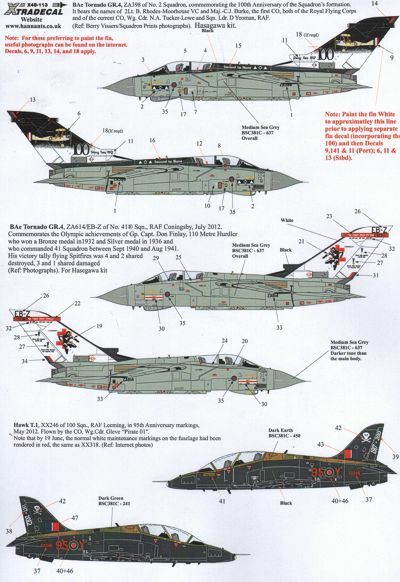 Panavia Tornado and decals (12) GR.1 ZA559/F 15(R) Sqn Lossiemouth 1990s; ZD748/AK 9(B) Sqn Bruggen 1980s; GR.4 ZA614/076 TEF Tornado Engineering Flight, Marham 2009; F.3 ZE736/F 1435 Flt Mt Pleasant 2008; IDS 45+03 DMTEU Luftwaffe 2007; 45+85 AG 51 Immelmann 2000s; 46+48 321 Sqn JBG 32 Luftwaffe 1999; 43+73 MFG 1 1980s; MM7047, 36-36 156th Sqn 36th Wing Italy 1990s; mm7054 50-40 155th Sqn 50th Wing Italy 2008; MM7232 36-10 12th FS; 36th Wing 2004; R Saudi Air Force 7506 75 Sqn; 11th FW. 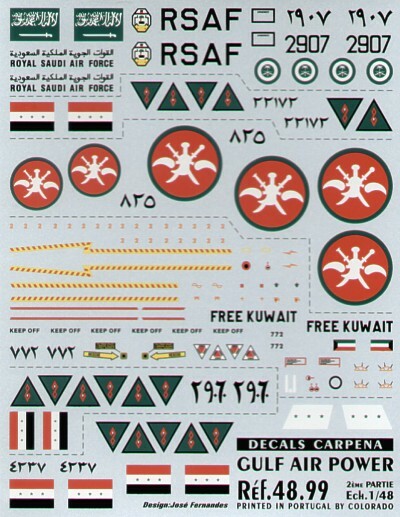 Dhahran 2007. 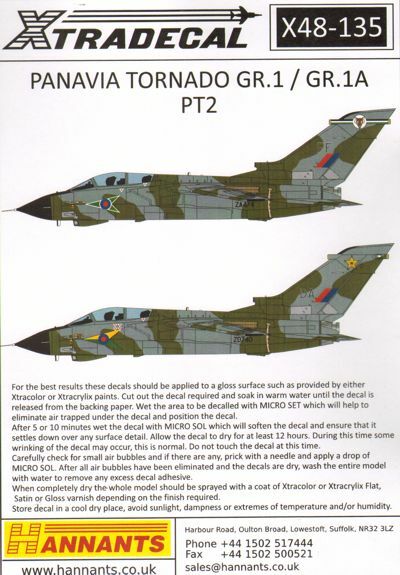 Operation Telic Stencils. 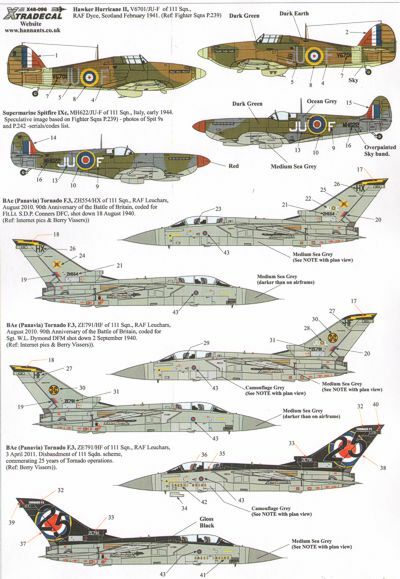 Typical stencil data as applied to RAF Panavia Tornado F.3 x 2, Panavia Tornado GR.4/GR.4A x 4 and BAe Harrier GR.7 x 4. 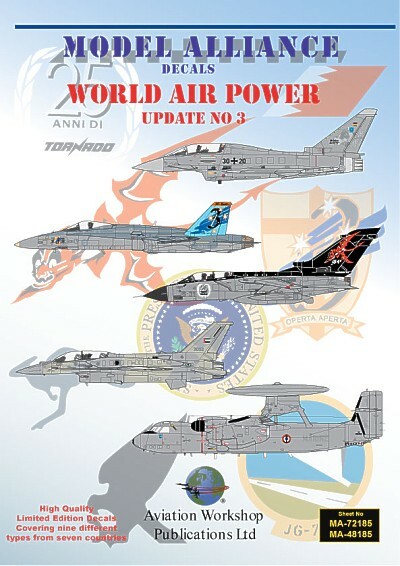 World Air Power Part 3 Nine aircraft types from seven countries (13 ) Lockheed-Martin F-16C No 115 or 207 2 Sqn R. Bahrani AF; Lockheed-Martin F-16F Fighting Falcon 3002 1 Sqn Al Dhafra United Arab Emirates 2008; Panavia Tornado IDS MM7006 6 Stormo 154 Grupo Anniversary 25 years Panavia Tornado with 154 Grupo; Grumman E-2C Hawkeye 165456/2 Fairford 2009; 165455/1 2008; 166417/3 carrier Charles de Gaulle 2006, all Flotille 4F; Eurofighter EF-2000 Typhoon T 30+17/GT0008; 30+20/GT0009 Anniversary markings; 30+33/GT0021 all Jagdgeschwader 74 Germany 2008; Typhoon S 30+47/GS0032 Jagdgeschwader 73 Steinhoff 2008; McDonnell-Douglas F/A-18A Hornet A21-13 3 Sqn 90 Years Anniversary RAAF Williamtown 2006; Sikorsky VH-60N Whitehawk 163266 Presidential Flight HMX-1 MCAS Quantico 2008. 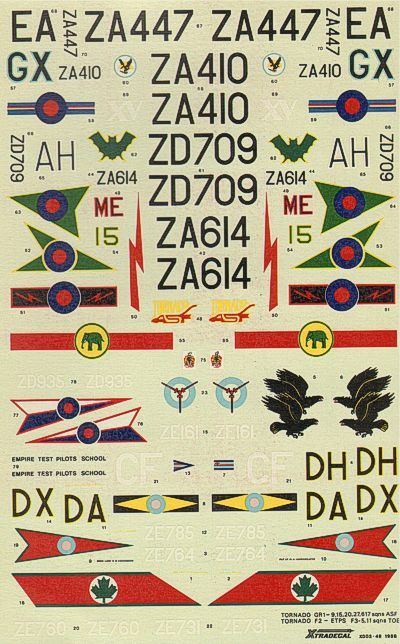 A4 size decal. 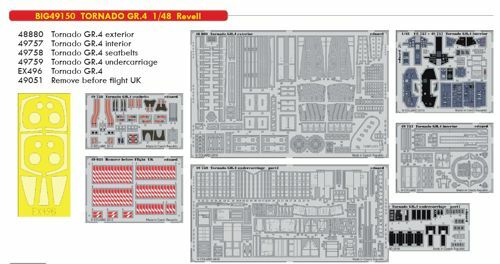 WAS £15.35. 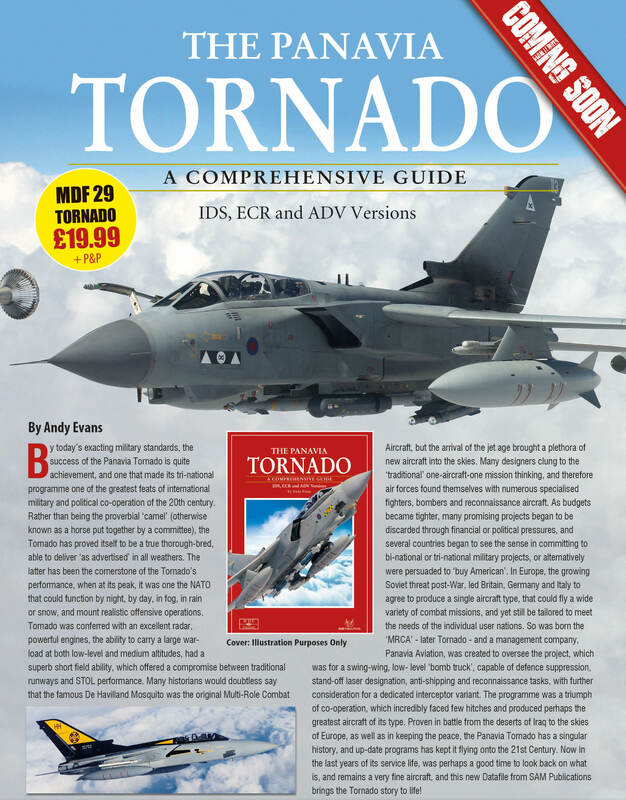 TEMPORARILY UNDER HALF PRICE!!! 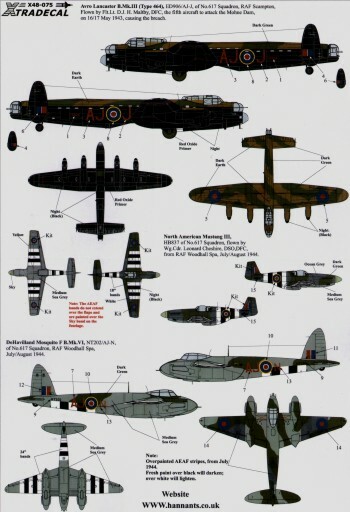 RAF 111 Squadron History Pt 1 (5) Hawker Hurricane Mk.I V6701 JU-F RAF Dyce Feb 1941; Supermarine Spitfire Mk.IXc MH622 JU-F Italy 1944; Panavia Torndao F.3 ZH554/HX Leuchars 2010 Coded JU-C for Fl Lt S.D.P.Connors DFC 1940; ZE791/HF Leuchars 2010 Coded JU-L for Sgt W.I.Dymond 1940, 90th Anniversary of the B of B; ZE791/HF in Disbandment scheme for 25 Years of Tornado operations, 7-4-2011. 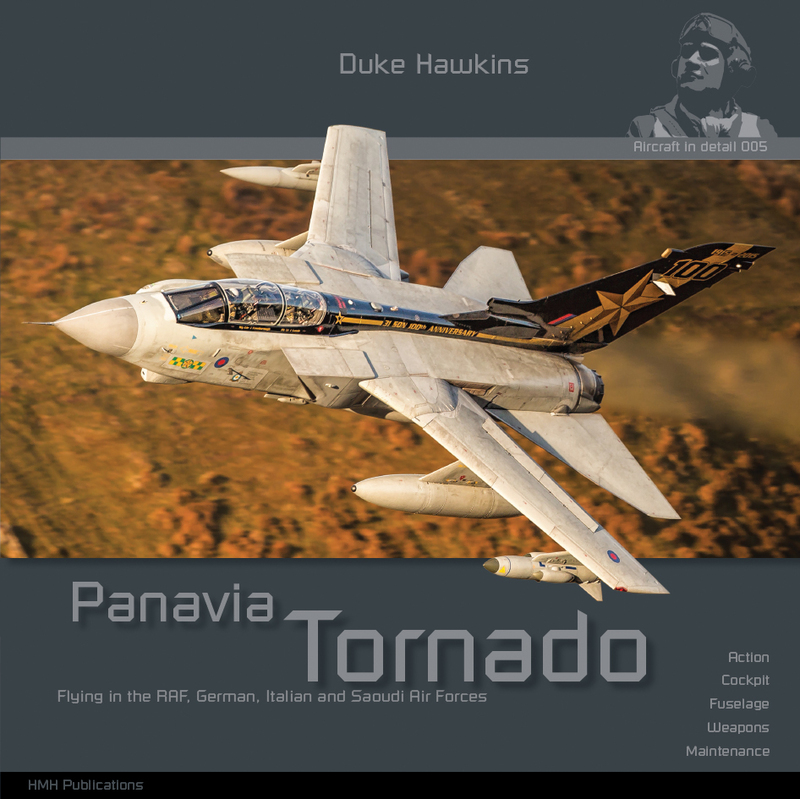 Panavia Tornado GR.1/GR.1A Pt.1 (6) ZA373/H 2 Sqn RAF Marham 1990; ZD714/BE 14 Sqn RAFG Bruggen 1985; ZA448/EB 15 Sqn RAFG Laarbruch 1984; ZA470/FL 16 Sqn RAFG Laarbruch 1984; ZA600/CM 17 Sqn RAFG Bruggen 1985; ZA411 AJ-S 617 Sqn RAF Marham 1989. 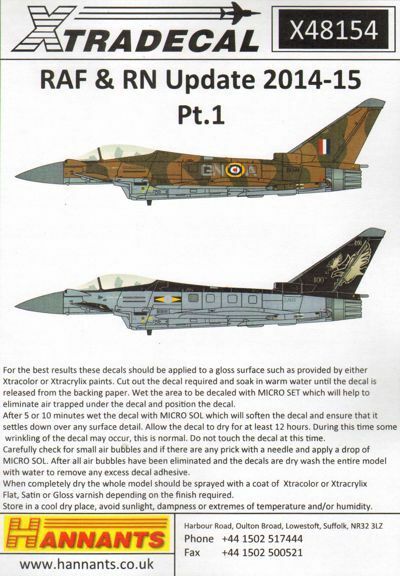 All overall green/dk sea grey camouflage scheme. 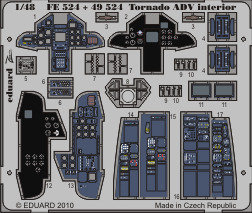 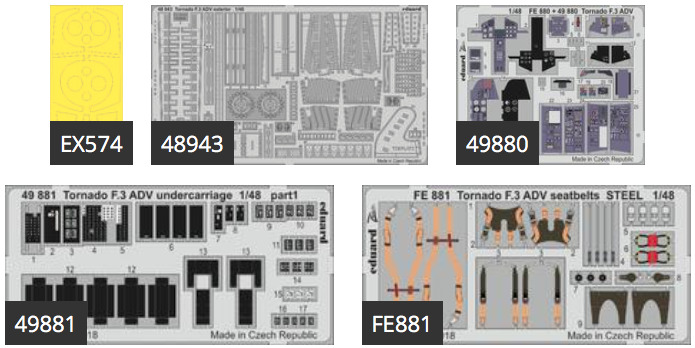 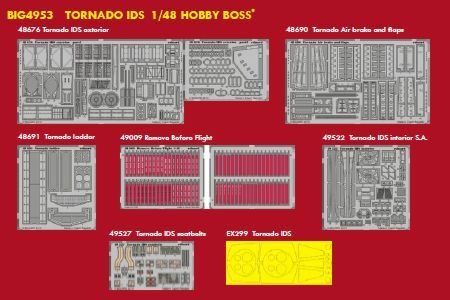 See X48138 for stencil data and ADTS7225 for the same Tornados inn1:72 scale. 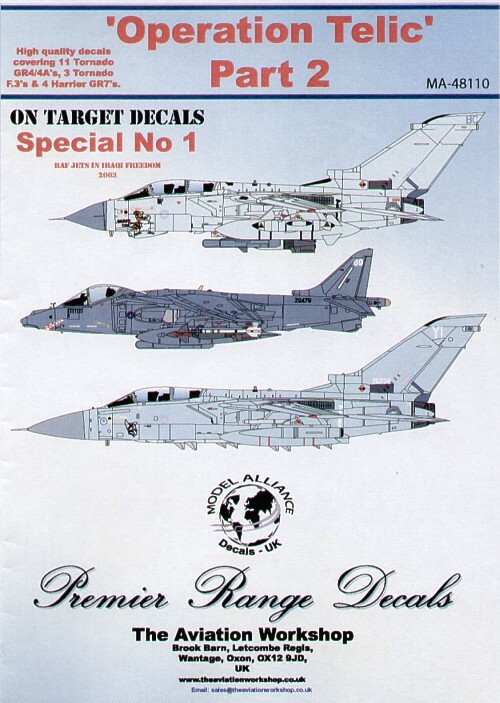 Panavia Tornado GR.1/GR.1A Pt.2 (5) ZD890/AE 9 Sqn RAF Bruggen 1990; ZA575/FF 12 Sqn RAF Lossiemouth 1994; ZG707/B 12 Sqn RAF Honington 1990; ZA613/04 27 Sqn RAF Marham 1983; ZD749/DA 31 Sqn RAFG Bruggen 1985. 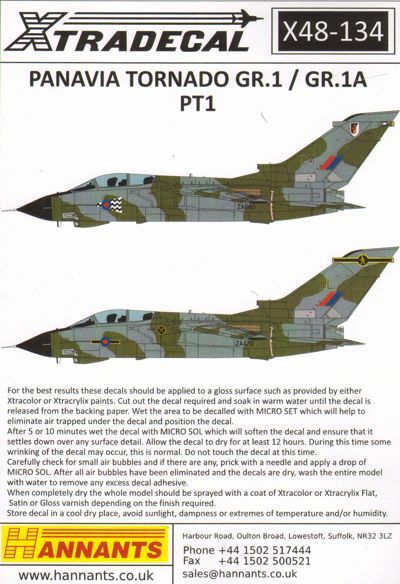 All overall green/dk sea grey camouflage scheme. 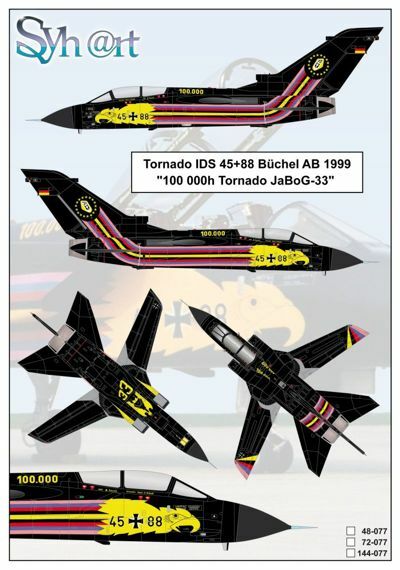 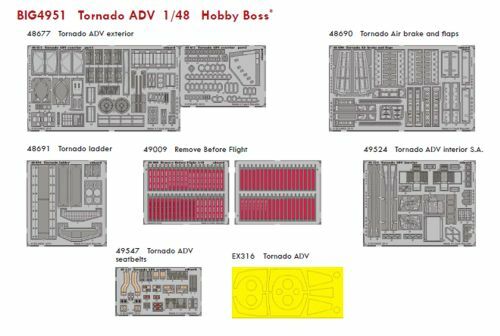 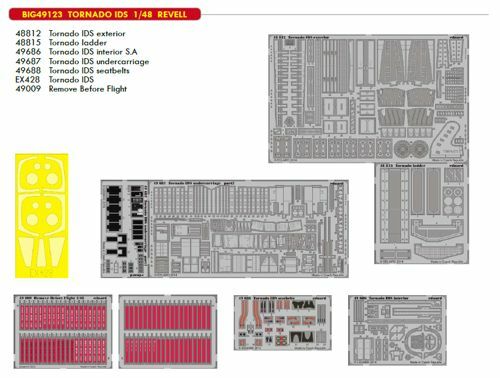 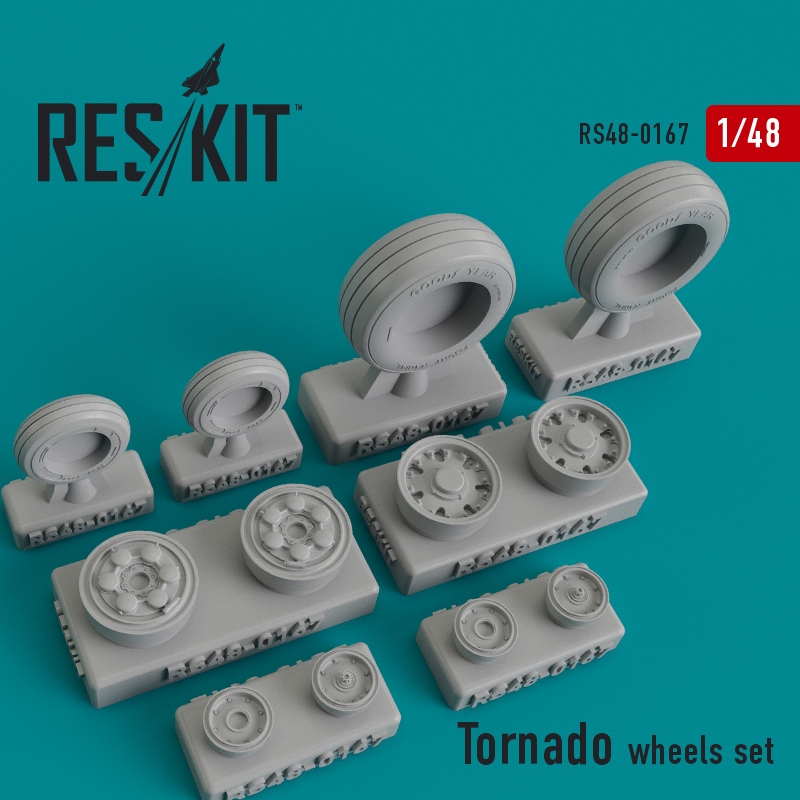 See X48138 for stencil data and ADTS7226 for the same Tornados inn 1:72 scale. 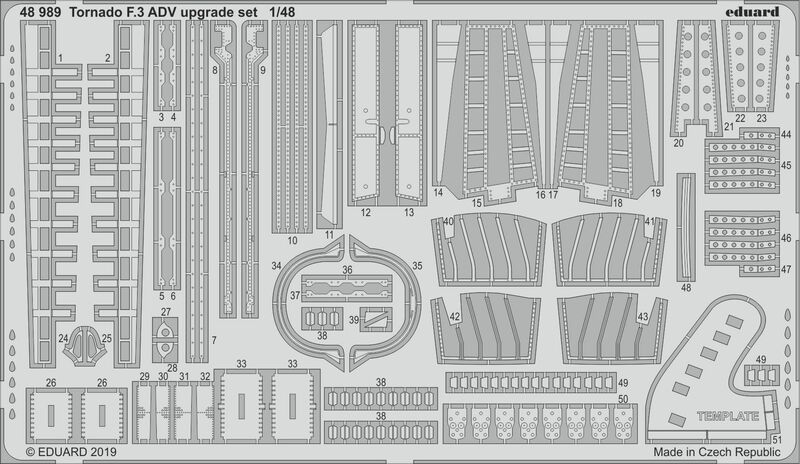 Re-printed! 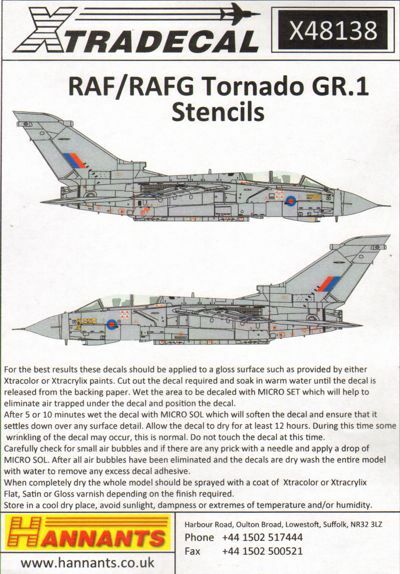 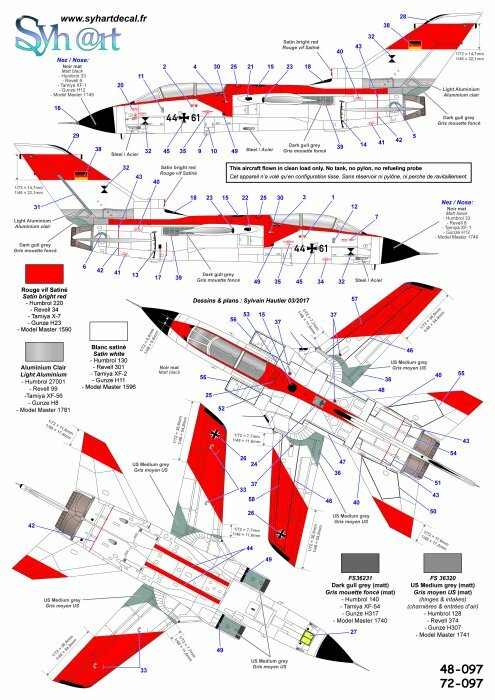 Panavia Tornado Gr.1 Stencil Data. 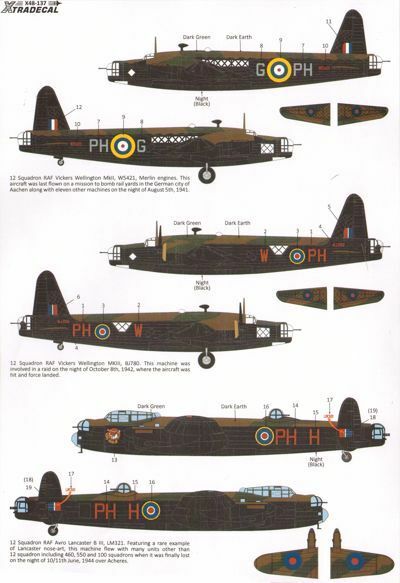 Complete stencil data for 2 UK and RAF Germany (RAFG) (1 each) based aircraft including underwing stores and uppersurface walkways. 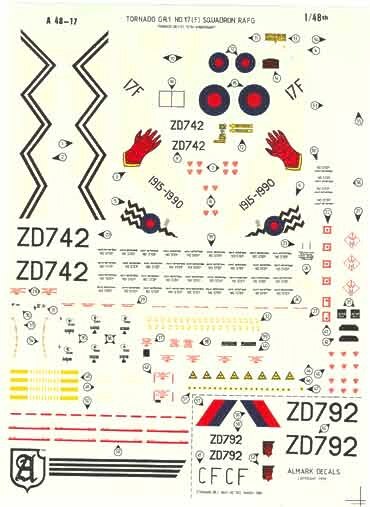 2 full size decal sheets. 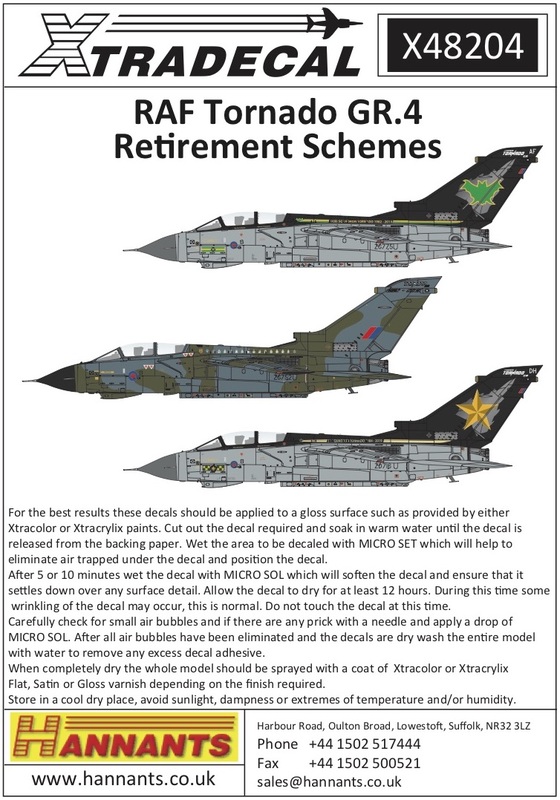 Panavia Tornado Special Schemes (3) Tornado GR.4 ZA461 XV(R) Sqn 100th Anniversary. 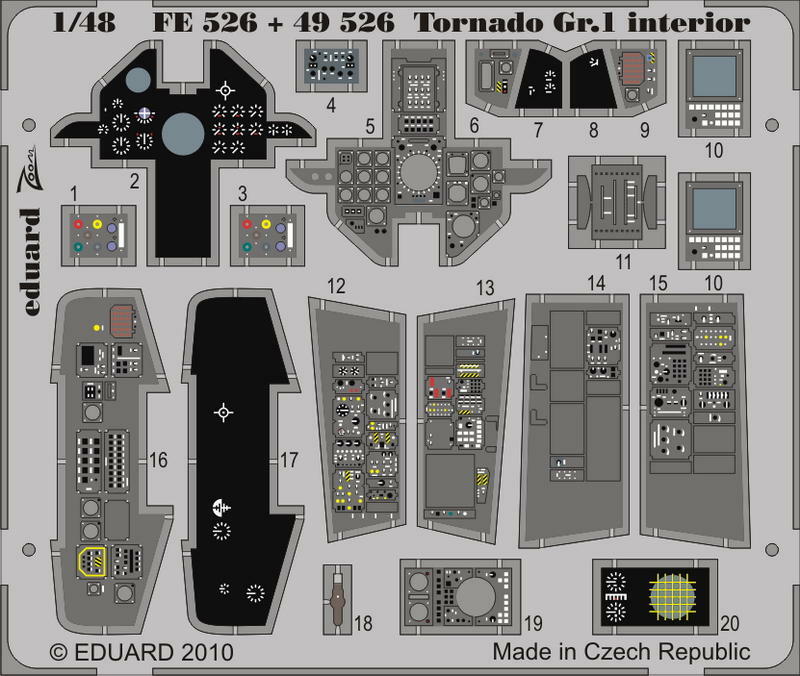 Wg. 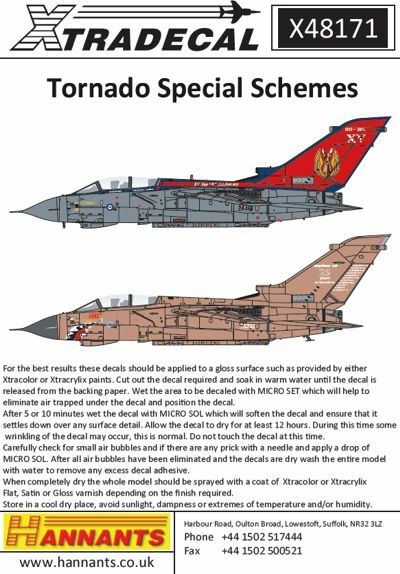 Cdr Jon Nixon/Sqn Ldr Conan Mullineux with red fin RAF Lossiemouth; Tornado GR.4 ZA456 9 Sqn 100th Anniversary. 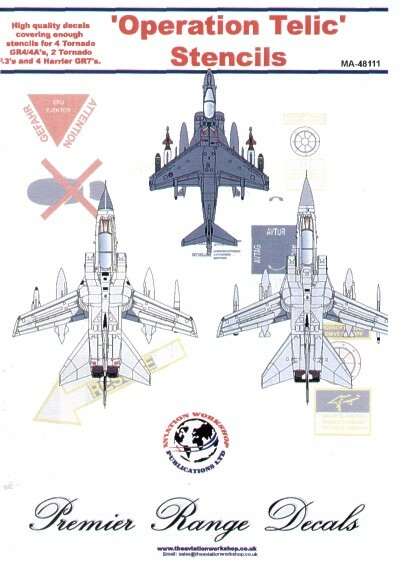 Wg. 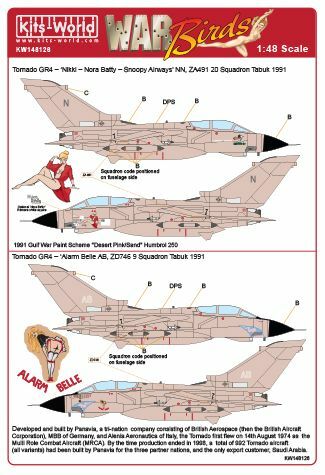 Com I.J.Sharrocks/Flt Lt A.H.Lock black fin RAF Marham; GR.4 ZG730 XV(R) Sqn RAF Lossiemouth, 25 Years on Ops in Desert Storm camouflage scheme. 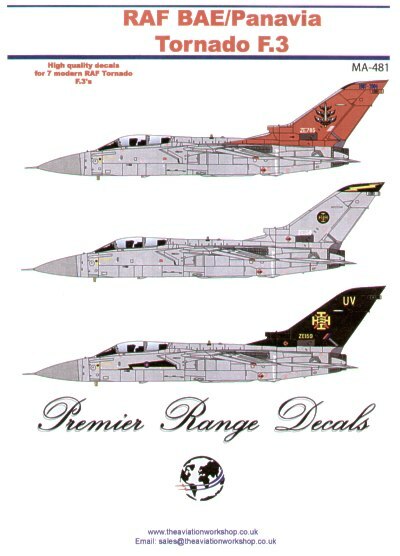 Includes two full size decal sheets with data for two Tornados including special colours for the Desert Storm camouflage. 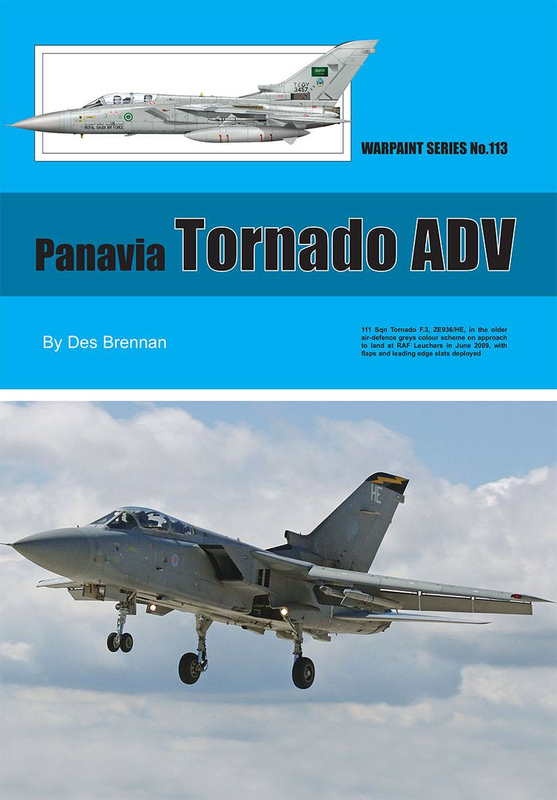 Panavia Tornado F.3 Part 1 (9) ZE734/JU 111 Sqn RAF Leuchars 2011; ZE785 F.3 OEU RAF Waddington 2003; ZE763/DG 11 Sqn RAF Leuchars 2006; ZE962/XC Dennis the Menace/Deere 29 and ZE731/YP Desperate Dan/Bishop 72 Both Leuchars Fighter Wing, Operation Telic, Saudia Arabia 2003; ZG757 43 Sqn RAF Leuchars 2006 overall black; ZG780 25 Sqn RAF Leeming 2006 black fin; ZH554 41 Sqn RAF Coningsby 2006; 3457 29 Sqn R. Saudi Air Force Dhahran, Saudi Arabia 1991. 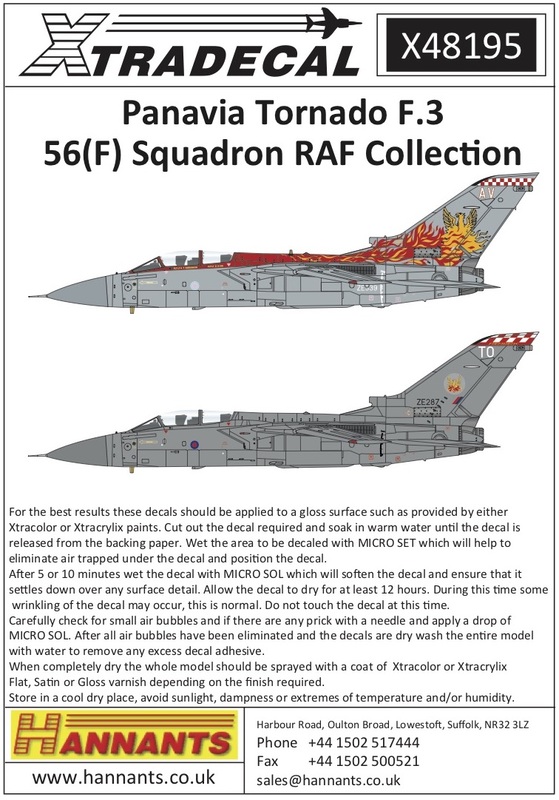 Panavia Tornado F.3 Part 2 56(F) Squadron Firebirds (4) ZE287/TO 56(F) Sqn line jet RAF Coningsby 2006; ZG772/WJ 56(F) Sqn RAF Leuchars 2005 Display Jet. 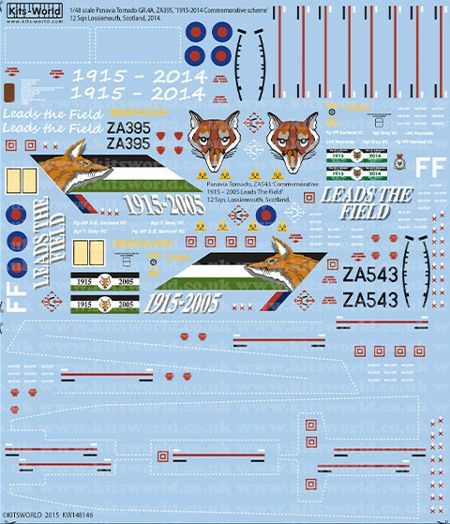 2 versions earlier one with 43(F) Sqn black and white fin top checks. 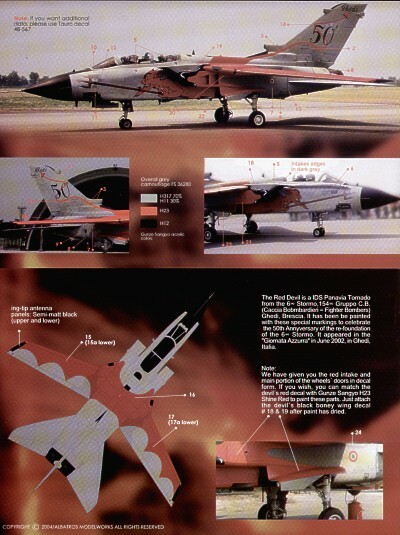 ZE339/AV 56(F) Sqn 2000 Display Jet, RAF Leuchars 2000.